We examined the initial clinical experience of Urological LESS surgery in our institution. Methods: Since June of 2008, a total of 10 patients underwent LESS surgery (simple Nephrectomy and renal cryoablation). Surgical Technique: Laparoscopic entry technique is performed using the Veress needle for initial CO2 insufflation. Umbilical site incision is used for the placement of a 12 mm bladeless trocar that is exchanged for the R-Port immediately after successful entry into the intraperitoneal cavity, allowing placement of instruments i.e. ; , laparoscopic ultrasound probe, staplers, clip appliers as traditional laparoscopic procedure but through a 1.2cm incision. The use of “linear” optics i.e. ; Olympus endoeyeTM, and laparoscopic instruments that can offer multiple functions (grasping/cutting/hemostasis); i.e. ; GYRUS bipolar cutting forceps, and instruments with high degree of freedom i.e. ; Cambridge Endo AutonomyTM Laparo-AngleTM, are pivotal to facilitate this surgical technique. Results: A total of 10 patients underwent LESS (2 Simple Nephrectomy and 8 Renal cryoablation). Conclusions: There is a learning curve for the proficient laparoscopic surgeon due to the technical challenge to triangulate and grasp tissues firmly enough to allow traction and counter-traction for exposure and dissection since the optics and working instruments are confined to a single axis or channel. 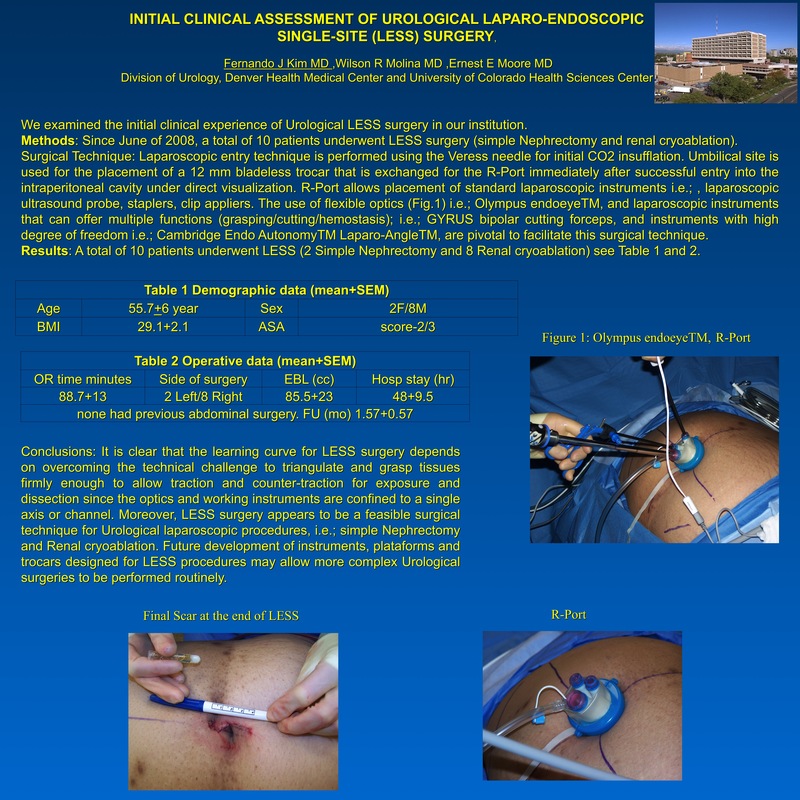 Moreover, LESS surgery appears to be a feasible surgical technique for Urological laparoscopic procedures, i.e. ; simple Nephrectomy and Renal cryoablation. Future development of instruments and trocars designed for LESS procedures may allow more complex Urological surgeries to be performed routinely.